Everyone loves a boat ride, but unfortunately for poor Pharaoh, this will be his last. In Sailing Toward Osiris, players each control a local Governor who must honour the Pharaoh as his funeral barge passes. Of course, the only way that a Governor can show the extent of their love and respect for Pharaoh is to build the most impressive monuments before the barge passes. The winner will be crowned the new Pharaoh and, with the stakes so high, the occasional underhanded effort to upset the plans of a rival is to be expected. Sailing Toward Osiris is essentially a worker placement game, in it two to five players compete to place the most valuable monuments on the most valuable spaces. Every player has a screen behind which they’ll hide their resources, cards and workers, introducing a light element of secrecy and deduction. At the beginning of the game players have access to one city card, a full set of boon cards and a few resources of each of the three kinds that feature in the game. At the beginning of each turn, each player draws three of the wooden worker tokens from a blind bag and then places them behind their screen. A number of the remaining workers will then be drawn and placed onto a “For Hire” section of the board. Each worker is presented in one of the three colours that match the resources; grain, clay or stone. There are also master workers (who have painted details) for each resource, and I’ll explain more about the differences between the workers later. Over the course of a game, each player will use their workers to obtain resources, but there are also a number of other actions and things to do. The game plays out in a series of alternating turns and players simply take one of the actions available to them each turn. This may be placing workers, or it could be planning a building, using a card, trading or any of a number of other actions. There are many interesting and unusual features about Sailing Toward Osiris that set it apart from other worker placement games, which often revolve around how far down the river the Pharaoh’s barge has progressed or who is the first person to take an action or use a card. Essentially, the winner is the player who scores the most points at the end of the game, which is usually a product of who can most effectively plan and place their monuments on the most valuable spaces. There’s a fair bit of variation in setup and use of placement slots depending on player count and open bartering (for favours, trades or whatever) is encouraged. For the sake of simplicity and in the name of fun, Sailing Toward Osiris feels quite a bit more like it was intended when played with four or five players, rather than two, for example. Whilst Sailing Toward Osiris was my first experience of a Daily Magic Games product, I have since seen one or two others (including Thieves Den, which we previewed here) and I can confirm that their reputation for excellent build quality is well founded. Sailing Toward Osiris feels like a premium product, one that has had no expense spared in terms of how the components were designed and sourced. Where monuments and resource tokens are concerned, for example, wood has been used as the material of choice, despite the fact that plastic or cardboard would almost certainly have been cheaper. The board itself depicts the river Nile, as well as the various mountain, clay pit and farm locations alongside it, as well as several cities. The board is thematically detailed and very appealing to the eye, but the distinct regions are drawn in such a way that the styling never impacts upon the playability of the game. The board is large enough that there is also a distinct space (shown as a desert) between the actual river spaces and the more abstract worker and resource markets, the monument planning spaces and so on. Most of these abstract spaces are shown using hieroglyphic style icons, but again, they leave absolutely no doubt about what each one is for — clay, stone and wheat spaces match the wooden tokens perfectly, as well as the locations from which you’ll draw them. The colours used (red, grey and yellow) also match the coloured workers, give Sailing Toward Osiris a very logical visual flow that (at least where resources and placements are concerned) requires next to no explanation. There are two decks of cards in the game, including boon and city cards. Both have distinct backs to ensure they can’t be mistaken for the other and boon cards feature a very classic, ancient art style which depicts the God’s that will bestow the boons in question — for example, Anubis or Osiris. The city cards are depicted in full colour using an art style that is thematic and detailed, but perhaps isn’t absolutely to my taste, even though I can’t fault it technically. Each of the city cards effectively shows a job, for example drover, stonecutter or magistrate. All of the cards in both decks are well made and the effects that they offer are clearly articulated to ensure they can be used quickly and simply. A turn in Sailing Toward Osiris involves a player taking one of several actions, then passing to the next player. Play continues around the table until one player either can’t (or doesn’t want to) take another action, at which point she will pass, which will enable her to claim the rank of The Regent (first player) for the next turn. When all players have passed, the round will end and a few cleanup activities are performed and the Pharaoh’s barge will make progress toward its destination. The actions available to players are quite varied, but they are all relatively simple. As I mentioned earlier, the players will each begin with three workers drawn at random from a bag. Regardless of the number of players, there are always two workers left in the bag after drawing and one of the benefits of being The Regent is that the player who holds that title may look into the bag after drawing, which provides them with a tiny bit of hidden information about what other players may have drawn. Players may place their workers on valid resource locations on the board. Normal workers can only be placed on sections of the river that are level with or behind the Pharaoh’s barge, whilst master workers can be placed on any open slot. Workers may also use caravan spaces to obtain a specific mix of resources, or they can be placed in a city to draw an additional city card for the player, plus one that must be given to someone else — for which a bribe may be taken! City and boon cards can both be played as actions, but each comes with its own restrictions. City cards effectively allow the player to do whatever is listed on them, or to be traded in for the resources shown in the top left-hand corner. Usually, the abilities they provide are powerful but context sensitive, so timing is critical. 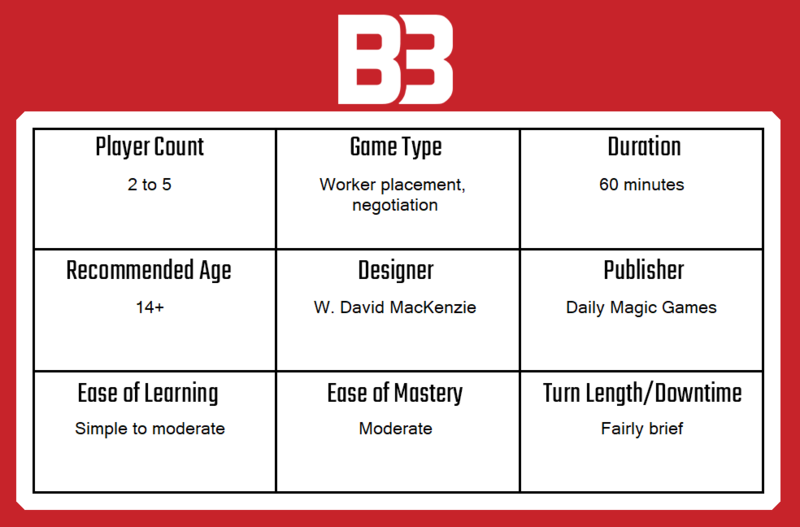 Where boons are concerned, each player has the same five options and can play only one per round of turns, with the added challenge that the same boon cannot be played twice in the same round. Boons can grant an extra consecutive action to be taken, for example, or to plan a monument and leave it on the board between rounds, whereas it would usually have to be withdrawn if it cannot be placed. Planning and building monuments are also actions in their own right. The first of these, planning, involves placing your proposed monument onto one of the silhouette spaces on the board and paying the amount in resources shown on that space. There are always at least two ways to build each monument using a different combination of resources, so players are free to pick which to use, as long as no one else’s building is already planned there. On the next turn (or any other turn that round) the player may then take an action to place that monument legally, which usually means finding a space that is not occupied by a worker or another monument, but it’s also worth noting that each of the three monument types (sphinxes, obelisks and pylons) has different placement restrictions. These actions continue for four full rounds, after each of which the Pharaoh’s barge moves one further section down the river toward the final space. After the fourth round, final scoring takes place and bonuses will be provided for things like having adjacent monuments, having a certain number of monuments in one section and so on. I should also mention that there are bonuses that take place during the game, such as when a monument is placed in the same river section as the barge, or for when the last monument of a certain type is placed. Overall, I think Sailing Toward Osiris is an excellent game that features some very tight design mechanics that are the result of what looks like very extensive playtesting. Firstly, the movement of the barge is a very interesting way of both tracking the round and introducing a number of ways to control the pace of the game. In the first round, placement of workers is restricted by the placement of the barge, but in the second, third and fourth round, new spaces open up — but others have been closed down due to the placement of monuments. Another unusual feature that really enhanced the experience in Sailing Toward Osiris is the ability to barter freely, given that resources are actually in pretty short supply. I’d say that in most games the supply of one or more resources will run out, which often prompts players to use their workers to draw city cards. The fact that the game then forces a player to give up one city card and positively encourages the other players to bid for it (perhaps by sharing their valuable resources) is just one way that the game enables this. There are many, many other negotiations that become relevant either in the moment or in order to enable long-term strategies, in Sailing Toward Osiris and the game doesn’t limit them — it simply provides a few mechanical and logistical caps and collars to enable the players. Because negotiation is so important and thanks to the way that the board is laid out, I would like to just call back to something I mentioned in the overview, which is that Sailing Toward Osiris does play better with four or five players. Firstly, there’s additional admin when setting up with fewer players (although the inclusion of that admin demonstrates how much testing went into this game because it is essential) but there are a few actual gameplay elements that are affected. For example, at two players the active player may return one of her two freshly drawn city cards to the house in exchange for one grain, or she may ask the other player to make a better offer. At two or three players, it’s unlikely that the competition to play boon cards will ever really have a negative effect, but it certainly does at five. Despite some issues when played by just two or three people, Sailing Toward Osiris is a masterpiece of design. It offers the players unusual freedom to take actions in any order and as frequently as possible, but it somehow never, ever becomes unbalanced — despite also including unfettered bartering. As long as the players are of a similar level of experience, there should never be more than two or three points between the top two players. This subtlety of design means that there is no need for tacked on “take that” mechanics and instead, the fundamental mechanics of the game involve jostling opponents for position continuously. Allies become enemies in a heartbeat, whilst you’ll immediately forget a slight against you in return for a favourable trade. Sailing Toward Osiris is also very straightforward to teach thanks to its visual simplicity and adherence to common sense. From an art perspective though, simple is very beautiful and everyone that I have played the game with has commented on what a lovely thing it is to both touch and see laid out on the table. If you predominantly play with four or five players, or if you feel that you can manage to get that many people together even three or four times a year, then I highly recommend Sailing Toward Osiris. Even if you can’t, then it is still a gorgeous game that benefits from incredible attention to detail and a very rigorous amount of testing, even at lower player counts. Sure, you’ll need to put more things out on the board — but I’m so glad that Daily Magic Games clearly took the time to invest their effort in ensuring that this wonderful game was playable by anyone, at any player count. As a result, this is one of my favourite games of 2018 so far. A copy of Sailing Toward Osiris was provided for review purposes. You can find out more about it on the website of publisher Daily Magic Games. Thanks to the generosity of Daily Magic Games and Asmodee UK, Big Boss Battle will be giving away a copy of Sailing Towards Osiris to one lucky entrant. The competition will be open from Sunday 21st October until Sunday 28th October and can be entered below. May I ask you, I am Russian, and the language barrier will be a problem for me? Possibly, although the game is relatively easy to learn and once you know it, then there is little/no reliance on language in game – only numbers and symbols. Good review, this looks interesting. i’m a History grad student working in the ancient Middle East and always on the lookout for more games set there. Hi Alan, thank you for the comment and feedback – much appreciated. I love the use of the theme here. Like many, I guess, it would be possible to replace it with something else but in Sailing Towards, the mechanical and thematic elements tie in very convincingly. I certainly couldn’t imagine a “better” fit or even equivalent theme. Are you familiar with the likes of Tigris and Euphrates and Kemet? The latter pushes the envelope towards fantasy, but it’s still a good experience. Thorough review. I love it! If we end up getting this we will probably save it for a night when we have a bigger group. We always have a group of three I can count on, but sometimes we have five. The artwork looks beautiful! Would love to win this game! The pressure!! Happy to mate – good luck! Thanks Ryan and good luck! Great review, I look forward to getting an opportunity to try it out! Thanks and good luck Bethany! Very thorough and informative review, I look forward to seeing what comes next! What a great review! Now I really want to try this game! Thank you mate, hope you get chance and enjoy it!